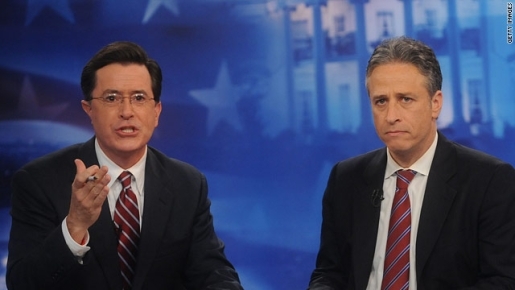 Colbert and Super PAC chairman Jon Stewart. You have to give credit to Stephen Colbert: when he’s going to make a joke, he’s going to run with the joke for as long as he possibly can before he gets in over his head. In the case of the Colbert Super PAC, officially known as “Americans for a Better Tomorrow, Tomorrow,” Colbert’s political satire has captured the eyes of a nation, or at least opened the wallets of some amused politicos. The former Colbert Super PAC has raised over $1 million dollars for its campaign in South Carolina, according to a filing made to the Federal Election Commission. Americans for a Better Tomorrow, Tomorrow (ABTT) would like it entered into the record that as of January 30th, 2012, the sum total of our donations was $1,023,121.24. I would like it noted for the record that I advised Mr. Colbert against including that quote. Americans for a Better Tomorrow, Tomorrow, Inc.
For the record, Stephen Colbert is still running for President of the United States of South Carolina, and as far as I know, he’ll still be in that state’s primary. He’s already started running his attack ads, so who knows just how far he’ll be able to take this thing, or what will happen to the Super PAC”s money should he withdraw from the race.